This course features a complete set of assignments and a series of lecture note outlines. This course focuses on general methods and strategies for the synthesis of complex organic molecules. Emphasis is on strategies for stereoselective synthesis, including stereocontrolled synthesis of complex acyclic compounds. Lecture Notes: Methods for the Asymmetric Synthesis of Complex Organic Molecules, Daniel J. O'Leary, Associate Professor of Chemistry, Pomona College (2001). Course grades will be based on two exams scheduled during the semester. There is no final exam. Gawley, Robert E., and Jeffrey Aubé. Principles of Asymmetric Synthesis. Oxford, UK: Pergamon, 1996. ISBN: 9780080418759. Lecture Notes: Methods for the Asymmetric Synthesis of Complex Organic Molecules. Daniel J. O'Leary, Associate Professor of Chemistry, Pomona College (2001). Carey, Frank A., and Richard J. Sundberg. Advanced Organic Chemistry. Part A. 4th ed. New York, NY: Springer-Verlag, 2000, chapters 2 and 3. ISBN: 9780306462436. Eliel, Ernest L., and Samuel H. Wilen. Stereochemistry of Organic Compounds. Hoboken, NJ: John Wiley & Sons, Inc., 1994. ISBN: 978471016700. Carey, and Sundberg. "Alkylation reactions." Chapter 1, "Aldol, Michael, Mannich reactions." Chapter 2, "Hydroboration." Chapter 4, "Organoboron, silicon, tin chemistry." Chapter 9, "Epoxidation." Chapter 12 in Advanced Organic Chemistry Part B. 4th ed. New York, NY: Springer-Verlag, 2001. ISBN: 9780306462450. Nokami, Junzo, Mamoru Ohkura, Yasufumi Dan-Oh, and Yasuhiko Sakamoto. "Facile synthesis of (+)-brefeldin A." Tetrahedron Letters 32, no. 21, (May 20, 1991): 2409-2412. Ohno, Masaji, Susumu Kobayashi, Takamasa Iimori, Yi-Fong Wang, and Toshio Izawa. "Synthesis of (S)- and (R)-4[(methoxycarbonyl)methyl]-2-azetidinone by chemicoenzymic approach." J Am Chem Soc 103, no. 9 (1981): 2405-2406. Kobayashi, Susumu, Keiji Kamiyama, Takamasa Iimori, and Masaji Ohno. "Creation of novel chiral synthons with enzymes and applications to natural product synthesis. 15. Efficient introduction of chiral centers into cyclohexane ring." Tetrahedron Letters 25, no. 24 (1984): 2557-2560. Mori, Kenji, and Hideto Mori. "Yeast reduction OF 2,2-dimethylcyclohexane-1,3-dione: (S)-(+)-3-hydroxy-2,2-dimethylcyclohexanone)." Organic Syntheses 8 (1993): 312. Masamune, Satoru, William Choy, John S. Petersen, and Lawrence R. Sita. "Double asymmetric synthesis and a new strategy for stereochemical control in organic synthesis." Angewandte Chemie International Edition in English 24, no. 1 (January 1985): 1-30. Stork, Gilbert, and Stanley Raucher. "Chiral synthesis of prostaglandins from carbohydrates. Synthesis of (+)-15-(S)-prostaglandin A2" J Am Chem Soc 98, no. 6 (1976): 1583-1584. Stork, Gilbert, Takashi Takahashi, Isao Kawamoto, and Toshio Suzuki. "Total synthesis of prostaglandin F2.alpha. by chirality transfer from D-glucose" J Am Chem Soc 100, no. 26 (1978): 8272-8273. Hanessian, Stephen. Total Synthesis of Natural Products: The "Chiron" Approach. 1st ed. New York, NY: Pergamon Press, 1983. ISBN: 9780080307152. Ho, Tse-Lok. Enantioselective Synthesis: Natural Products from Chiral Terpenes. New York, NY: Wiley, 1992. ISBN: 9780471548195. Seebach, Dieter, Andrea R. Sting, and Matthias Hoffmann. "Self-Regeneration of Stereocenters (SRS) - Applications, Limitations, and Abandonment of a Synthetic Principle." Angewandte Chemie International Edition in English 35, no. 23-24 (December 1996): 2708-2748. Andreas, Job, Carsten F. Janeck, Wolfgang Bettray, René Peters, and Dieter Enders. "The SAMP-/RAMP-hydrazone methodology in asymmetric synthesis." Tetrahedron 58, no. 12 (March 18, 2002): 2253-2329. Enders, Dieter, Helmut Kipphardt, and Peter Fey. "Asymmetric syntheses using the samp-/ramphydrazone method: (s)-(+)-4-methyl-3-heptanone." Organic Syntheses. Vol. 8. p. 403, Vol. 65. p. 183. Houk, K. N., and B. List. "Asymmetric Organocatalysis." Accounts of Chemical Research 37, no. 8 (Aug 2004): 487. Berkessel, A., and H. Gröger. Asymmetric Organocatalysis. Weinheim, Germany: Wiley-VCH, 2005. Behenna, Douglas C., and Brian M. Stoltz. "The Enantioselective Tsuji Allylation." J Am Chem Soc 126 (2004): 15044. Trost, B. M. , and J. Xu. "Regio- and enantioselective Pd-catalyzed allylic alkylation of ketones through allyl enol carbonates." J Am Chem Soc 127, no. 9 (Mar 9, 2005): 2846-7. Hodous, B. L. , and G. C. Fu. "Enantioselective addition of amines to ketenes catalyzed by a planar-chiral derivative of PPY: possible intervention of chiral Bronsted-acid catalysis." J Am Chem Soc 124, no. 34 (Aug 28, 2002): 10006-7. Knochel, P., N. Millot, A. L. Rodriguez, and C. E. Tucker. "Preparation and Applications of Functionalized Organozinc Compounds." Organic Reactions 58 (2001): 417-731. Knochel, P. , and P. Jones. Organozinc Reagents: A Practical Approach in Chemistry. Edited by Thomas G. Bac. Oxford, UK: Oxford University Press, 1999. ISBN: 9780198501411. Pu, L., and H. Yu. "Catalytic Asymmetric Organozinc Additions to Carbonyl Compounds." B Chem Rev 101 (2001): 757. Li, Hongmei, and Patrick J. Walsh. "Catalytic Asymmetric Vinylation of Ketones." J Am Chem Soc 126, no. 21 (2004): 6538-6539. Pu, L. "Asymmetric Alkynylzinc Additions to Aldehydes and Ketones." Tetrahedron 59 (2003): 9873. Denmark, S. E., and N. G. Almstead. "Allylation of Carbonyls: Methodology and Stereochemistry." In Modern Carbonyl Chemistry. Edited by J. Otera. Vol XIX. Weinheim: Wiley-VCH, 2000, pp. 299-402. ISBN: 9783527298716. Chemler, S. R., and W. R. Roush. 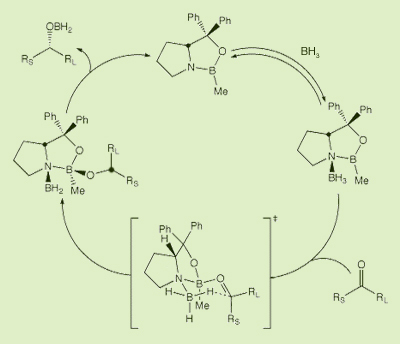 "Recent Applications of the Allylation Reaction to the Synthesis of Natural Products." In Modern Carbonyl Chemistry. Edited by J. Otera. Vol. XIX. Weinheim: Wiley-VCH, 2000, pp. 403-490. ISBN: 9783527298716. Denmark, S. E., and J. Fu. "Catalytic Enantioselective Addition of Allylic Organometallic Reagents to Aldehydes and Ketones." Chem Rev 103 (2003): 2763-2793. Kennedy, J. W. J., and D. G. Hall. "Recent Advances in the Activation of Boron and Silicon Reagents for Stereocontrolled Allylation Reactions." Angew Chem Int Ed 42 (2003): 4732. Szymoniak, J. and C. Moise. "Synthesis and Reactivity of Allyltitanium Derivatives." In Titanium and Zirconium in Organic Synthesis. Edited by I. Marek. Weinheim: Wiley-VCH, 2002, pp. 451-474. ISBN: 9783527304288. Duthaler, R. O., and A. Hafner. "Chiral Titanium Complexes for Enantioselective Addition of Nucleophiles to Carbonyl Groups." Chem Rev 92 (1992): 807. Zhang, X., K. N. Houk, and J. L. Leighton. "Origins of Stereoselectivity in Strain-Release Allylations." Angew Chem Int Ed 44 (2005): 938. Keck, G. E., and D. Krishnamurthy. "Catalytic Asymmetric Allylation (CAA) Reactions: (S)-1-(Phenylmethoxy)-4-Penten-2-ol." Org Syn 75, no. 12 (1997). A useful recent review: Brunel, J. M. "BINOL: A Versatile Chiral Reagent." Chem Rev 105 (2005): 857. Hackman, B. M., P. J. Lombardi, and J. L. Leighton. "Highly Diastereo- and Enantioselective Reagents for Aldehyde Crotylation." Org Lett 6 (2004): 4375-4377. Roush, William R., Alan D. Palkowitz, and Kaori Ando. "Acyclic diastereoselective synthesis using Tartrate Ester-Modified Crotylboronates. Double Asymmetric Reactions with .Alpha.-Methyl Chiral Aldehydes and synthesis of the C(19)-C(29) segment of rifamycin S." J Am Chem Soc 112, no. 17 (1990): 6348-6359. Nelson, S. G. "Catalyzed Enantioselective Aldol Additions of Latent Enolate Equivalents." Tetrahedron: Asymmetry 9 (1998): 357-89. Mahrwald, R. "Diastereoselection in Lewis-Acid-Mediated Aldol Additions." Chem Rev 99 (1999): 1095-1120. Machajewski, T. D., and C. H. Wong. "The Catalytic Asymmetric Aldol Reaction." Angew Chem Int Ed 39 (2000): 1352. Franklin, A. S., and I. Paterson. "Recent Developments in Asymmetric Aldol Methodology." Contemp. Org Syn 1 (1994). Carreira, E. M. "Recent Advances in Asymmetric Aldol Addition Reactions." In Catalytic Asymmetric Synthesis. 2nd ed. Edited by Iwao Ojima. New York, NY: Wiley-VCH, 2000. ISBN: 9780471298052. ———. "Aldol Reactions: Methodology and Stereochemistry." In Modern Carbonyl Chemistry. Edited by J. Otera. Vol. XIX. Weinheim: Wiley-VCH, 2000. ISBN: 9783527298716. Paterson, I., C. J. Cowden, and D. J. Wallace. "Stereoselective Aldol Reactions in the Synthesis of Polyketide Natural Products." In Modern Carbonyl Chemistry. Edited by J. Otera. Vol. XIX. Weinheim: Wiley-VCH, 2000, pp. 249-298. ISBN: 9783527298716. Mahrwald, Rainer, ed. Modern Aldol Reactions. 2 vols. Foreword by David A. Evans. Weinheim: Wiley-VCH, 2004. ISBN: 9783527307142. Evans, D. A., S. J. Siska, and V. J. Cee. "Resurrecting the Cornforth Model for Carbonyl Addition: Studies on the Origin of 1, 2-Asymmetric Induction in Enolate Additions to Heteroatom-Substituted Aldehydes." Angew Chem Int Ed 42 (2003): 1761-1765. Palomo, C., M. Oiarbide, and J. M. Garcia. "Current Progress in the Asymmetric Aldol Addition Reaction." Chem Soc Rev 33 (2004): 65. Gage, J. R., D. A. Evans. "(S)-4-Phenylmethyl-2-Oxazolidinone." Organic Syntheses 68 (1989): 77-82. Cowden, C. J., and I. Paterson "Asymmetric Aldol Reactions Using Boron Enolates." Organic Reactions 51, no. 1 (1997). Evans, David A., Jason S. Tedrow, Jared T. Shaw, and C. Wade Downey. "Diasteroselective Magnesium Halide Catalyzed Anti-Aldol Reactions of Chiral N-Acyloxazolidinones." J Am Chem Soc 124 (2002): 392-393. Evans, David A., C. Wade Downey, Jared T. Shaw, and Jason S. Tedrow. "Magnesium Halide-Catalyzed Anti-Aldol Reaction of Chiral N-Acylthiazoldinethiones." Org Lett 4 (2002): 1127-1130. Abiko, A. "Boron-Mediated Aldol Reaction of Carboxylic Esters." Acc. Chem. Res. 37 (2004):387. See also: Org Synth Coll 10: 55, and 343. List, B. "Proline-Catalyzed Asymmetric Reactions." Tetrahedron 58 (2002): 5573. List, B. "Enamine Catalysis Is a Powerful Strategy for the Catalytic Generation and Use of Carbanion Equivalents." B Acc Chem Res 37 (2004): 548. Notz, W., F. Tanaka, and C. F. Barbas. "Enamine-Based Organocatalysis with Proline and Diamines." Acc. Chem. Res. 37 (2004): 580. Hajos, Z. G., and D. R. Parrish. "( + )-(7aS)-7a-Methyl-2,3,7,7a-Tetrahydro-1 H-Indene-1,5-(6H)-Dione." Organic Syntheses Coll. 7: 363, 63: 26. Carreira, Erick M., Robert A. Singer, and Wheeseong Lee. "Catalytic, Enantioselective Aldol Additions with Methyl and Ethyl Acetate O-Silyl Enolates: A Chiral Tridentate Chelate as a Ligand for Titanium(IV)." J Am Chem Soc 116, no. 19 (1994): 8837-8838. Evans, D. A., M. C. Kozlowski, J. A. Murry, C. S. Burgey, B. Connell, and R. J. Staples. "C2-Symmetric Copper(II) Complexes as Chiral Lewis Acids. Scope and Mechanism of Catalytic Enantioselective Aldol Additions of Enolsilanes to (Benzyloxy) Acetaldehyde." J Am Chem Soc 121 (1999): 669-685. Itsuno, S. "Enantioselective Reduction of Ketones." Organic Reactions 52 (1998): 395. Corey, E. J., and C. J. Helal. "Reduction of Carbonyl Compounds with Chiral Oxazaborolidine Catalysts: A New Paradigm for Enantioselective Catalysis and a Powerful Synthetic Method." Angew Chem Int Ed 37 (1998): 1987. Kitamura, Masato, Takeshi Ohkuma, Shinichi Inoue, Noboru Sayo, Hidenori Kumobayashi, Susumu Akutagawa, Tetsuo Ohta, Hidemasa Takaya, and Ryoji Noyori. "Homogeneous asymmetric hydrogenation of functionalized ketones." J Am Chem Soc 110, no. 2 (1988): 629-631. Also see: Noyori, R., et. al. Organic Syntheses Coll 9: 589. Hoveyda, A., D. A. Evans, and G. C. Fu. "Substrate-Directable Chemical Reactions." Chem Rev 93 (1993): 1307. Ohkuma, T., M. Kitamura, and R. Noyori. "Asymmetric Hydrogenation." In Catalytic Asymmetric Synthesis. 2nd ed. Edited by Iwao Ojima. New York, NY: Wiley-VCH, 2000, pp. 1-110. ISBN: 9780471298052. Sundberg, Richard J., and Francis A. Carey. "Hydroboration," "Dihydroxylation," and "Epoxidation." Chapter 4, and 12 in Advanced Organic Chemistry, Part B: Reaction and Synthesis. 4th ed. New York, NY: Springer-Verlag, 2001, pp. 226-241, 757-762, and 762-782. ISBN: 9780306462443. Crudden, C. M., D. Edwards, and J. Eur. "Catalytic Asymmetric Hydroboration: Recent Advances and Applications in Carbon-Carbon Bond-Forming Reactions." Org Chem (2003): 4695. Johnson, R. A., and K. B. Sharpless. "Catalytic Asymmetric Dihydroxylation: Discovery and Development." In Catalytic Asymmetric Synthesis. 2nd ed. Edited by Iwao Ojima. New York, NY: Wiley-VCH, 2000, pp. 357-398. ISBN: 9780471298052. Bolm, C., J. P. Hildebrand, and K. Muniz. "Recent Advances in Asymmetric Dihydroxylation and Aminohydroxylation." In Catalytic Asymmetric Synthesis. 2nd ed. Edited by Iwao Ojima. New York, NY: Wiley-VCH, 2000, pp. 398-428. ISBN: 9780471298052. Kolb, H. C., M. S. VanNieuwenhze, K. B. Sharpless. "Catalytic Asymmetric Dihydroxylation." Chem Rev 94 (1994): 2483. R. Oi, and K. B. Sharpless. "3-(1S,2-Dihydroxyethyl)-1,5-Dihydro-3H-2,4-Benzodioxepine." Org Synth 73, no. 1: (1995). McKee, B. H., D. Gilheany, and K. B. Sharpless. "R,R-1,2-Diphenyl-1,2-ethanediol (stilbene diol)." Org Synth 70, no. 47: (1991). Sundberg, Richard J. and Francis A. Carey. Advanced Organic Chemistry. 4th ed. Part B: Reaction and Synthesis. New York, NY: Springer-Verlag, 2001. ISBN: 9780306462443. Johnson, R. A., and K. B. Sharpless. "Catalytic Asymmetric Epoxidation of Allylic Alcohols." In Catalytic Asymmetric Synthesis. 2nd ed. Edited by Iwao Ojima. New York, NY: Wiley-VCH, 2000, pp. 231-285. ISBN: 9780471298052. Katsuki, T. "Asymmetric Epoxidation of Unfunctionalized Olefins and Related Reactions." In Catalytic Asymmetric Synthesis. 2nd ed. Edited by Iwao Ojima. New York, NY: Wiley-VCH, 2000, pp. 287-326. ISBN: 9780471298052. Katsuki, T, and V.S. Martin. "Asymmetric Epoxidation of Allylic Alcohols: The Katsuki-Sharpless Epoxidation Reactions." Org Reactions 48, no. 1 (1996).